Welcome to The Lodges at Table Rock!!! Step into your “Home Away From Home” our 6 bedroom/6 bath lodge!! Less than ½ mile to Silver Dollar City and only a couple of miles to Indian Point Marina on Table Rock Lake. Our lodge sleeps up 22 people each with 6 master suites, ALL with king beds and convertible beds throughout. Oh, did we mention that each bedroom is equipped with its OWN master bath as well?? 4 Jacuzzi tubs upstairs and stand up showers downstairs. 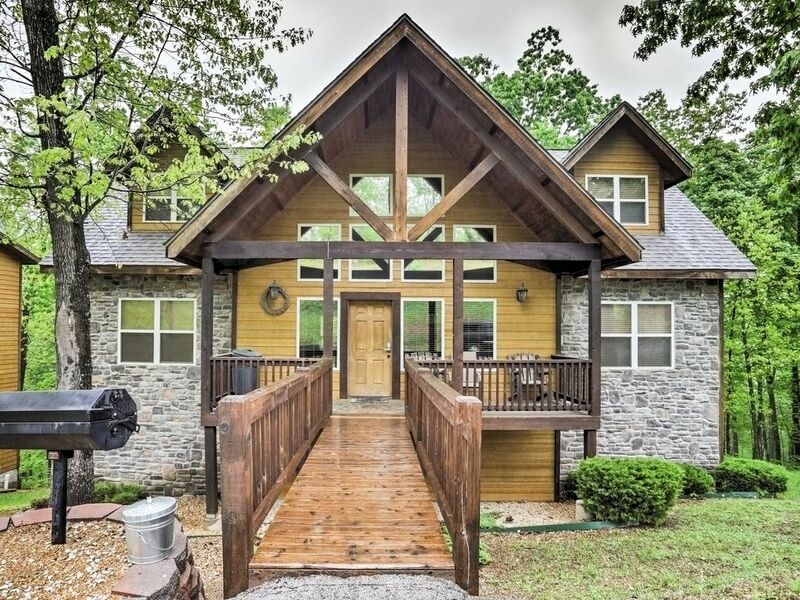 As mentioned, we are across from Silver Dollar City, just down the road from Indian Point Marina and only minutes away from the Branson Landing, too many options to list. Words just cannot describe the almost 4000 square feet of amenities!!! Cozy up to the stone gas fireplace, hang out on the screened in porch with stainless steel propane BBQ grill. Keep up on your laundry with our washer and dryer. Prepare meals in the fully furnished kitchen. Stay connected with wireless internet, cable television and DVD players. We could type for hours, but know your time is valuable. We invite you check out the link provided below to see pictures for yourself or better yet, call us today for a personal description of our property! Let us book your next vacation and make it the best yet! The house was perfect for our group. The owners were great to work with. We had such a great time, we hope to make it an annual trip! Parking is awful! Had to fight for parking in front of the house. I understand there are muliple vehicles with each rental, but we were shocked at the parking situation. House was not very clean. Needs good housekeeping top to bottom. Floors very dirty, sliding doors dirty, washer and dryer need replacement, very cheap dishwasher. Lucky I brought pans and utensils with me. Chairs on front porch should be thrown away, VERY dirty. Pool was nice. VERY HILLY AREA, which is fine, just would have been nice to know upfront. Beds OK. Screened in porch very dirty and small, we repaired screen to stop bugs from coming in. Fridge in porch in bad shape...did not even have a handle on it. Big enough for our family. Very close to Silver Dollar City, which was nice BUT FAR away from everything else. Would not stay again. Over all....we have spent time in VRBO's all over the country, this was not in the top 10. Just OK. Our family had a great time, but it certainly wasn't due to this house! We surprised our family with a trip to Branson for Christmas. Our stay was brief but the house was nice for our purposes. Would stay here again. Plenty of room for multiple families. Close to the marina, 2 min drive to the pool , play ground and fire pit due to a steep hill. My family enjoyed it. Over all it was good. But the description on home away is different from what we actually got. The over all living space was good enough for 20 people. But the kitchen was small and felt crowded for those many. Even thought the description in home away shows gas grill, the house don't have one. And some of the house in that community have gas grill. We actually needed one gas grill. The owners told they will make some adjustments after the stay. But didn't hear from them afterwards. Since we enjoyed the stay, thought to leave it. But should update the website accordingly. Apologize for the confusion on the gas/charcoal grills. We have 3 properties with charcoal grills, and 2 with gas grills. Per our conversation, we were not aware of your need for a gas grill for the weekend as you booked directly via VRBO and didn't contact us until your arrival at the property. We will definitely update the site to state we have both charcoal/gas grills to avoid this confusion for future reservations. We had planned to discount your stay $50/night, but then spent $95 on unclogging the toilet that was left clogged upon your departure. The photos on the site are accurate for kitchen area, shows seating for 8 at the Kitchen table, with 3 barstools around the kitchen counter. Golf: Close to Branson Creek, the #1 Public Golf Course in Missouri!